Hey everybody! I had a great time at AirVenture this year. 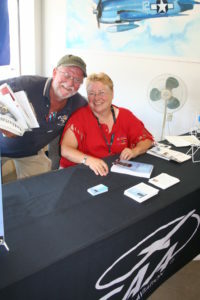 I gave a presentation on the History of Air Traffic Control and did 5 book signings during the event. 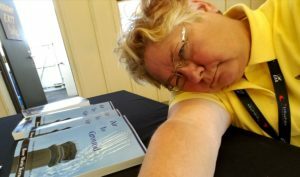 If you scroll down you’ll see my blog about what went on this week – a complete blow by blow of the personal experiences of a senior citizen/ex-ATC Specialist/woman galloping through a week of insanity. Scroll down for a Day by Day Look at One Woman’s Oshkosh Experience – Modified Daily! 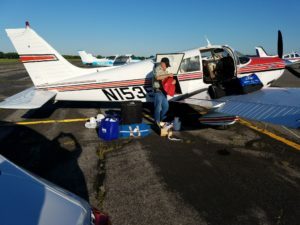 I am in the final stages of preparing to participate in the biggest, noisiest, busiest and most exciting aviation event in the world – the Experimental Aircraft Association’s (EAA) AirVenture! 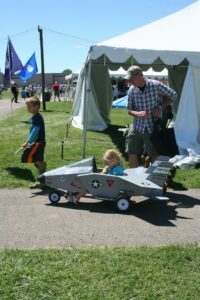 For one week during the dog days of summer over half a million people fly, drive, walk, or bus to the little town of Oshkosh, Wisconsin to join in this massive celebration of flight. Over 100,000 aircraft will land on the single runway during the week, most of the time more than one at a time. Pilots and Vendors arrive from all over the world. Many pilots camp on the grounds under their aircraft wings. There are small single engine homebuilt aircraft, big executive jets, modern military aircraft, helicopters and vintage warbirds both on static display and in the air. Hundreds of experts give presentations on everything from how to weld a wing strut or repair an old engine to what’s the latest greatest piece of aviation navigational equipment. Though I’ve attended in the past on behalf of the FAA, this will be the first year I attend as an individual – and on Saturday the 29th I will be lecturing on the History of Air Traffic Control, including insights on today’s concerns about the future of ATC. Tomorrow morning I will be flying out of Sandia Air Park east of Albuquerque with veteran CFII pilot Jon Daffer in his Piper Cherokee. Though I’ve flown with a lot of friends in the past, this is the first time I will be flying in a small aircraft for 10 hours! I am already trying to adjust to that notion. So how do I prepare? Well, first of all I gotta keep the luggage to a minimum. Weight is a factor in small aircraft, especially when you are taking off from an airport with a field elevation of almost a mile high. This means you pack minimum clothing and extras for the trip – then when you get to your destination you can bop over to the store and pick up things like shampoo, snacks and drinks. I am glad that I have kindle on my cell phone so I don’t have to pack my usual stack of reading materials. The biggest factor is timing the flight for the best weather possible. For this flight we are not facing any major frontal activity, but there is enough ambient moisture throughout the country right now that scattered afternoon thunderstorms will be a factor. To get ahead of the game we are going to take off by 6am. This means getting up by 5am…and driving 30 miles to the airport. Those who know me will understand that this may well be the most challenging portion of the day. I am not an early riser and most times I need several cups of strong tea before I encounter such things as sunlight and highways. What makes it more death defying is that I don’t dare drink ANY thing like tea or coffee that contains a diuretic. Little planes don’t have bathrooms. We plan to stop only twice Enroute, God help me. Luckily, Jon will be doing all the flying and he is a morning person – I just have to get out there! Because Oshkosh itself is a real madhouse, we plan to fly to Milwaukee then rent a car. During this event the University of Wisconsin at Oshkosh rents out dorm rooms – at $70/night it is the cheapest accommodation in town. There is no air conditioning or maid service. You can bet we will be picking up fans at the same time we get the shampoo and drinks. Being from the desert, we can take heat well, but dread the humidity. Up at 4:30am, feed the dogs, toss the luggage in the car and head up the highway to Sandia Air Park (1N1) out east of Albuquerque. Now, mind you, I in no way shape or form resemble a “morning” person. Those few souls who shared the strip of pavement upon which I careened with semi-closed eyelids had no idea their lives were in danger. Nonetheless, my hour long journey in the wee hours before dawn was completed with no one swapping paint. My friend and pilot for the journey, Jon Daffer, had the hanger door open as I pulled into his private drive. Jon is an amazing, multi-talented individual. 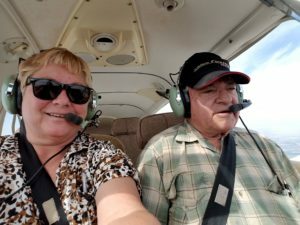 He is a CFII, a retired ATC, a glider pilot, a sailor who navigates by the stars, a ham radio operator, wine maker and for fun, he likes to tinker with aircraft. I once went by his home in a nice residential suburb in the northeast heights of Albuquerque and saw the fuselage of a Piper Cub in his garage – but the wings were in the dining room. He pulled the P28A (Piper Archer) out of the hanger and we loaded her up. We checked the weather forecast – looked like a good flight until right before Wisconsin. A few storms lingered in the southern portion of the Badger State, but they were moving southeast and would hopefully be gone well before we got there. By 6:30am we were on the first leg of our journey to AirVenture. The plan was to fly 4 hours before taking a break and fuel stop in Kansas. Though Jon was doing most of the flying, he alleviated the tedium of a long flight by assuming the mantel of instructor – and insisting I learn how to handle the controls. As part of my job in Air Traffic, I’d long since learned how to read the instruments – so that part was easy. The hard part was reaching the rudder pedals with my short legs. Since we were starting out in central New Mexico at a field elevation of about 5,000 feet MSL, we decided to do the whole trip at FL095. I have flown as a passenger in about 24 different kinds of aircraft over the years, but this was the first time I had my hands on the controls. You know how in the movies you see somebody do dramatic things with aircraft controls? They push them around with energetic authority then we see a shot of the aircraft diving to the ground or climbing and turning with the agility of an airshow performer. The first thing I learned was NOT to do that. Gentle even movements on the yoke is better for turns and you have to use your feet to keep the aircraft even. I found myself focusing on the instrument panel and Jon kept telling me to look outside at the horizon. The hardest part was to just keep it going evenly at altitude – not let it wander up or down, or accidentally turn because you exert the tiniest fraction of pressure to the yoke when you reach down and grab a cell phone to take a picture because the cloud just to the right of you looks just like Elton John singing Rocket Man. After four hours we landed at KMHK – Manhattan, Kansas. It had a tower and looked pretty from the air. The AFD said it had two FBO’s – one read as though it was for GA and the other for Jets. The weather was bright, clear and hot as Hades…we started sweating as we descended through 4,000. We headed over to the GA hanger…which was very hard to distinguish as the old sign was well faded. We didn’t see much moving around it. We walked into the hangar and called out – no answer…we tried every door we could thinking we might find someone inside – all locked. Finally a young man drove into the hangar in the golf cart and he informed us no one was about. Of course, after four hours we REALLY needed a restroom – and the young guy informed us that we had to go outside the gate next to the FBO in order to get to the front door – which was in the same building we were standing in, but no one was allowed to use the door directly to the office. We were also told that when we came back we would need to call security to re-open the gate! One does not argue with necessity. We took turns so that one person could stay on the ramp side and open the gate when the other was done. Bless his heart, Jon let me go first. I got inside the FBO – a really bare and small place that hadn’t seen a broom and dustpan for years, and the restroom rivaled a bus station in Juarez, Mexico. I longed for a can of Lysol. Back outside I called Jon over to open the gate – he’d been hooking up the plane to the fuel island. We switched places for a few. It was then he revealed the one and only good thing about this ghastly FBO – they probably had the cheapest fuel in the Midwest. Of course there was no food at all, either there or at the other FBO that catered to Jet traffic, so we got back into the plane and headed out. We had a couple bottles of water in the plane and I’d brought a bag of raw pecans and we made do with that for the 2nd half of the flight. 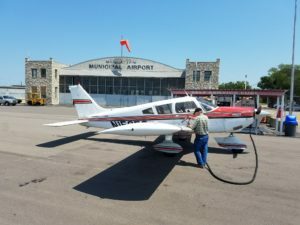 For us, the Manhanttan Kansas GA FBO redefined the term “Pit Stop”. The trip continued smooth until the last 50 miles or so. We skirted the remnants of storms which had moved off to the southeast as forecast. Jon set her down gently on the runway at MWC – Milwaukee’s Timmerman airport about 5pm local time. The FBO there was a relief in so many ways – clean, populated, and friendly. It was what you expect an FBO to be. In short order we’d transferred our luggage to a rental car and headed north to the University of Wisconsin at Oshkosh. We had our first meal of the day halfway there. At the University we lined up with a hundred other pilots checking into one of the dormatories for the week Their staff pretty much had the whole process down to a fine art, so it took only half an hour. The room key was really a key – what a concept! Our rooms were near each other on the 10th floor – yes, it did have an elevator. They were fairly small containing two narrow metal bunk beds that were probably recycled from World War II, two desks, two clothes nooks/doorless closets, and two dressers. It did contain a small refrigerator freezer and a microwave. Wrapped in plastic on the bed was a package containing thin white sheets, a towel and a rag. A small bar of soap was on the dresser. The thin scratchy blue blanket was also folded up into a square on the bed next to a pillow I could have used as a placemat. Cinder block walls completed the prison cell effect nicely. Did I mention the room had no air conditioning? Luckily the window did open, and in any case, I was so tired after a total of 12 hours of traveling that I quickly descended into a somnolescent state. Monday, July 24th – Opening Day! Up at 5:30am….Jon’s phone call rattled me into semi-consciousness. Morning people…don’t you just love ’em. We parked in the Blue Lot – as close as possible but still quite a hike from the entrance gates. Avoiding puddles left over from the previous nights thunderstorms we joined the influx of eager participants. Security rifled through my camera bag then passed us through. Already the air hummed with aircraft engines – a sound that never stopped the entire time we were there – the symphony resounded from the soft thrumming of small aircraft, the whoosh of larger ones, and helicopter percussion with an occasional crescendo of screaming fighter jets throughout the day. The first thing we did was consult the map to find those places I would be signing books over the next week and walk to them; the SkyShoppe, Wearhouse, and Welcome Center. The EAA provides free maps and programs to everyone which is absolutely needed. With events, exhibits, shops, museums, and more scattered over a few miles you need a way to show the expected half million attendees where to go! We decided to start this year’s adventure on the North side and work our way south over the course of the week. Our first stop was the Warbird field. Lucky for us a thin overcast filtered the summer sun reducing the heat. Humidity to a desert child is torture enough! Shuttles and school busses provide some relief for sore feet. I think I am going to weigh myself when I get home…if I lose more than 10 pounds I’ll make a fortune selling the “Oshkosh Diet and Exercise Program”. There is a special tram ride within the Warbird area with a tour guide pointing out all the different kinds of fighters and bombers and giving key information on the wars they flew in and a little history of each type. The Mustangs of World War II all featured names and artwork on the fuselage. We spent most of the day there, then made our way to the Wearhouse for my 4pm book signing. After an hour there I scooted over to the Skyshoppe for another hour’s book signing. 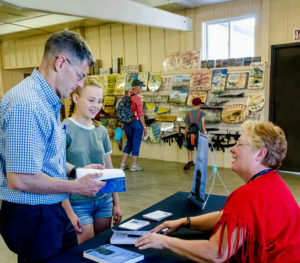 I love that several people came up to me and said “I read your column all the time, it is the first thing I look for when I open up the magazine!” The AirVenture program lists any author book signings so many of my pilot friends who live far from New Mexico knew exactly where to find me. More and more as the day progressed I realized that AirVenture in Oshkosh was more than just a fun vacation, it’s a family reunion – with a really BIG family! I live in Albuquerque, New Mexico – home of the week long International Balloon Fiesta which I have attended at least 22 times over the years. It is one of those few places where just walking around the field makes you euphoric. Brightly colored balloons, the roar of the propane tanks as they light up the fires and lift off – hundreds of them at a time…it’s magic. Then there is Oshkosh AirVenture. From the time you arrive to the time you leave something is always happening. I’d been there once before as an FSS Briefer, so I had limited time to really take everything in. This time I wandered the field with an old friend who’d been going there for many years and he knew where to find all the most exciting stuff. 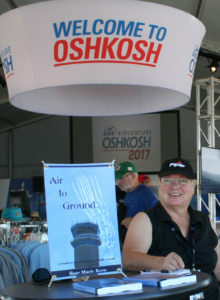 AirVenture allowed me the privilege of selling my book, Air To Ground in all their stores and made arrangements for me to hold book signing events five times over the course of the week. I was also delighted to give a presentation at the Aviation Museum on the “History of Air Traffic Control.” Because my appearances were published in the program, several of my readers were able to find me. In the picture to the left picture is a long time friend, Drew Gillette, from the east coast whom I met at a Solar Fiesta event in New Mexico over 20 years ago and saw I would be there in the program which allowed us to hook up again – how delightful was that! With my Canon Powershot in hand I explored as much of it as I could from the Museums to the Warbirds, the exhibits, the Vintage aircraft, helicopters, sport aircraft, gliders, and the KidVenture. Boeing Plaza featured aircraft so huge the tails had to be fit between buildings well off the square! 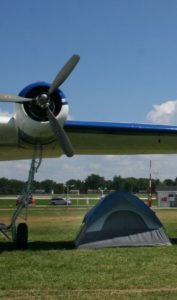 I have to admit I was fascinated by the romance of camping beneath the wings of your aircraft – and ALL sizes of aircraft sported tents from big old DC3’s to little bitty RV’s. When I was younger I would have jumped all over that option. 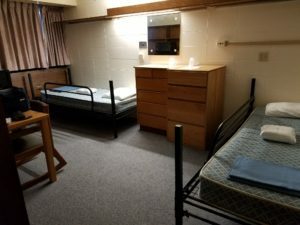 This year I “camped out” in one of the non-air-conditioned Dorm rooms at the University of Wisconsin – the iron beds felt like they were WWII surplus so I guess that counts. Tim Hartong, the editor of Plane and Pilot News, invited me to the Hartzell Propeller dinner on Monday evening where I also had the pleasure of running into several members of the East Central Ohio Pilot Association. Most of the time I was on the airfield by 8am for at least 12 hours. With the extensive grounds and hundreds of interesting presentations, I was really glad for the tram system! I was gratified to note that the Women in Aviation group is growing by leaps and bounds. It is open not only to pilots but to those with any interest or employment in aviation. (Men can join if they want to but the emphasis is on helping girls and women get ahead). They estimated over 900 women were crammed into the group photo taken in Boeing plaza. Timeless Voices of Aviation is an EAA project which tries to capture stories on all aspects of flight from pilots and mechanics to ATC, medical, military – you name it. They interviewed me on Tuesday morning at the Aviation Museum’s Paul Harvey theater, so my face and voice are recorded for posterity along with a thousand others. I was told that the ones done during this year’s AirVenture will be on the EAA website in a month or so and that many of these are also sent to the Smithsonian. Knowing that the future of General Aviation is in the hands of children, there is a whole section of the airfield devoted to KidVenture. 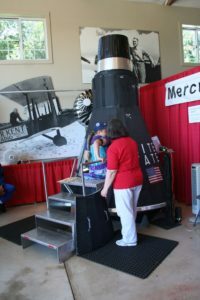 Kids can climb into old aircraft, learn how to make propellers, sand struts, and swing tethered drones in circles. Of course the majestic and beautiful old Warbirds dominate a large area on the north side of the grounds. I took the special tour which starts in a tent with experts giving a little history and information. Did you know the phrase “The whole nine yards” refers to how long the belt of bullets fed into guns on an old Warbird is? This year’s focus was the 75th anniversary of the Doolittle Raid on Japan in WWII. Sixteen B-25 bombers took off from the deck of the USS Hornet, led by Colonel Jimmy Doolittle. They were to fly over Japan, drop their bombs and fly on to land in a part of China that was still free. Of course it didn’t turn out to be that easy, but it did cause Japan to go on the defensive which was a major factor in turning the tide of the war in the Pacific. I was happy to see the options available to those with mobility issues at AirVenture – after all it is a really big place! Rental of scooters allowed many of our older pilots and other interested people to join in the celebrations. Senior soldiers wandered around the Warbirds and lovingly patted the landing gear of old friends. 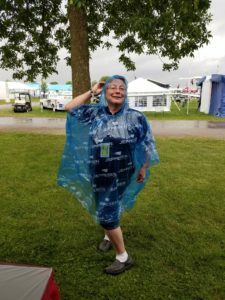 It only really rained one day of the event, thank heaven for the little plastic raincoats given out at the Jeppesen exhibit! That evening was the first of the nighttime airshows – fabulous lights in the sky with glowing smoke and bright dancing hoops on the paragliders. The clouds held it in until the fireworks began then a torrential downburst slammed into everyone as they scrambled for any possible shelter. I watched as the pyrotechnics defied the storm from under the roof of the Theater in the Woods, then slogged my way through mud to my car. The big picture of AirVenture is fascinating – and everything is so well organized and planned right down to the smallest detail. The only thing lacking is adequate parking for the thousands of people trying to drive into the event. During the week it wasn’t too bad, but on Friday and Saturday the lines extended from both the north and south entrances all the way back to the highway exits – several miles of cars not moving at all! Many of you reading this will nod your heads with the memories it invokes, but for those who have never been there – you gotta do it at least once. If you don’t like crowds go Monday through Thursday – a lot happens every day and besides, the big exhibitors still have lots of giveaways those days. When you get there grab a program and look for my name – I’d be delighted to see you!